The beautiful new northern extension to the existing center consists of a large Fitness Hall, equipped with the most modern, state of the art equipement, a Table Tennis Hall, a Billiard Hall and additional areas for further expansion of activities. 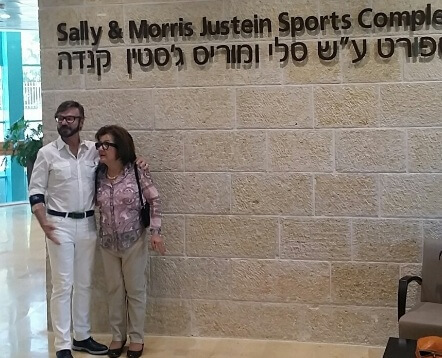 Pamela and Paul Austin, Morris and Sally Justein’s daughter and son-in-law, honored us with their presence and took part in the unveiling of the naming plaque in honor and memory of the Justein family, who have given their name to the newly built complex. Haim Bar, Chairman of the Zahal Disabled Veterans Organization spoke of the magnanimous generosity and the modest nature of the late Morris Justein, Alon Dahan, Chairman of the Board of Jerusalem’s Beit Halochem emphasized he speaks on behalf of all the Zahal Disabled Veterans when he expressed the heartfelt gratitude for the support and embrace of the Justein and Austin families. The ZDVO and Beit Halochem are deeply indebted to the Justein family for their ongoing support and magnanimous generosity.